Black Panther (2018). Directed by Ryan Coogler. I’ve had a very mixed weekend. I was considering going to the movies yesterday but my painful back, hip and knees would’ve made sitting still uncomfortable. My body is telling me the seasons are starting to change, and that really is depressing – I haven’t finished my love affair with this summer yet. But with some careful management (stretching, hot packs and yoga), I managed to get some quality gardening time in, and planted a heap of vegetable seedlings. Also yesterday, there was a state election here in Tasmania, and from my point of view (and anyone working in the arts sector) the results were less than encouraging. So, I was in the perfect mood for some blockbuster action to take my mind off things, and (with a makeshift back bolster) went to the local Village Cinema to see the latest offering from Marvel Studios. Black Panther didn’t disappoint! It has an excellent premise, a top-notch cast and some fine action moments. 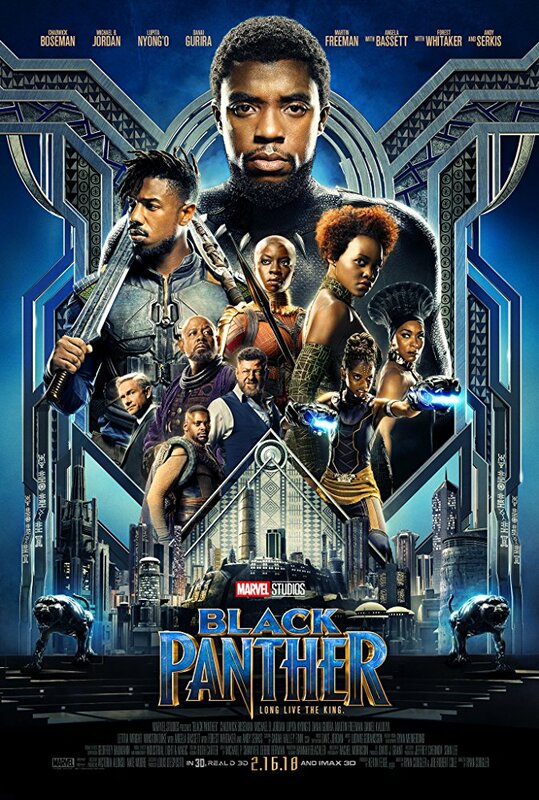 The film begins with a really beautiful animation that backgrounds the history of Wakanda, the fictional African nation that is the only place on earth to find the equally fictional vibranium (the metal used to construct Captain America’s shield) and this gives new viewers enough backstory to get them through the film. The story picks up from the end of Captain America: Civil War (2016) where Prince T’Challa (Chadwick Boseman) returns home after the death of his father to become king of Wakanda. Ulysses Klaue (played with manic relish by Andy Serkis) makes a return, as does CIA agent Emmett Ross (Martin Freeman) – but the rest of the main cast are black and many of the strongest characters are female. It’s also pertinent to point out that all the female characters are appropriately dressed for their roles, don’t try and fight in high heels, don’t require saving and have some of the best dialogue. In fact, at one point a character does complain about having to wear a wig to a casino, which (for me) really drives the point home. The action scenes are for the most part, the high quality I expect from the MCU, but there’s a couple of ropey moments that don’t quite work. A car chase in Seoul (part of which features in the trailer) is a real standout and will certainly bear repeat viewing when the DVD comes out. Narratively, it’s a little baggy and threatened to get bogged down in the second act but the final act is very good and (unlike so many films in this genre) I don’t think the last big fight scene outstays its welcome. I’ll be seeking out other films by Ryan Coogler now for sure! For me, three things really made this film work. Firstly, at one point I genuinely forgot I was watching a Marvel film, I was fully invested in the characters and story in the moment, without all the add-on Marvel baggage. Secondly, the two young boys in the row behind, their gasps and obvious delight reminded me how important pure action entertainment is. But above all, I really liked that this film raised questions of how to deal with refugees, sharing knowledge, resources and how (for a film that’s based on a comic book), they strove to resolve those questions. It brought to mind the often quoted phrase “when you have more than you need, build a longer table, not a higher fence”.